Each time you buy something in your Mailchimp account, we’ll issue a receipt. There are two types of receipts: an email receipt, and the printable version that’s stored in your account. In this article, you’ll learn how to understand your Mailchimp email receipt, and how to find the printable receipt in your account. After you make a purchase in Mailchimp, we’ll send an email receipt to the account’s billing contact. Here’s an example of what an email receipt looks like for a specific account—in this case, an American user who bought a Monthly Plan and a few optional add-ons. Your receipt will vary depending on your billing plan, add-ons, discounts, and location-based taxes. Here’s what each section of the receipt means. Each purchase has an order number and the date and time Mailchimp processed the order. This section shows discounts that the account is eligible for, or ones that have already been applied. In the payment section, you’ll see the payment method used for the purchase. The end of the email receipt will show who the receipt was issued to and by—in other words, the buyer and seller. Issued to will display information about you, the buyer. 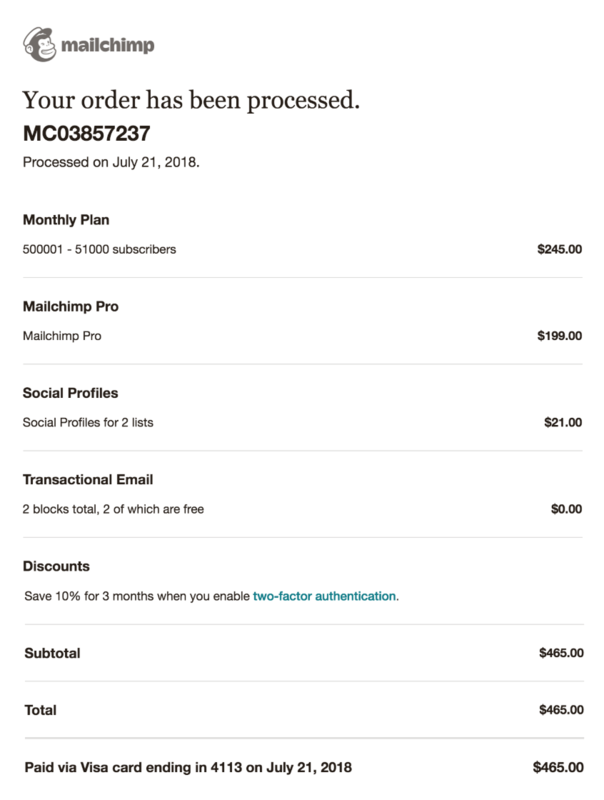 Most things you can buy in Mailchimp must be purchased individually, so you should expect to get an individual receipt for each order. However, certain recurring add-ons like Mailchimp Pro and Social Profiles will appear on the same receipt as your Monthly Plan. Check out this table to learn about possible charges you might see on a receipt. Monthly Plan An auto-pay plan that covers the cost of email marketing features. This monthly charge is based on your peak total subscriber count, billed once per month. Pay As You Go A pre-paid plan that covers the cost of email marketing features. This is not a recurring plan, but you can buy more Pay As You Go credits if you run out of email sends. Ad A web ad launched from a Mailchimp account. We send your ad budget straight to the vendor (Facebook, Instagram, or Google). Add-ons Optional paid features for the account, like Social Profiles and Mailchimp Pro. Transactional Email Blocks of transactional email credits purchased for Mandrill. Goods and services tax (GST) A tax on goods and services, including digital products like Mailchimp, that applies to certain international accounts. Value-added tax (VAT) A value-added tax on goods and services, including digital products like Mailchimp, that applies to certain international accounts. Take a look around our knowledge base for more answers to common questions about our pricing plans and billing. For your records, a copy of each receipt is also stored in the Billing history section of your Mailchimp account. The layout of this receipt is a little different so it’s easy to print. To a view a printable web version of your receipt, follow these steps. Click the View In Your Account button. 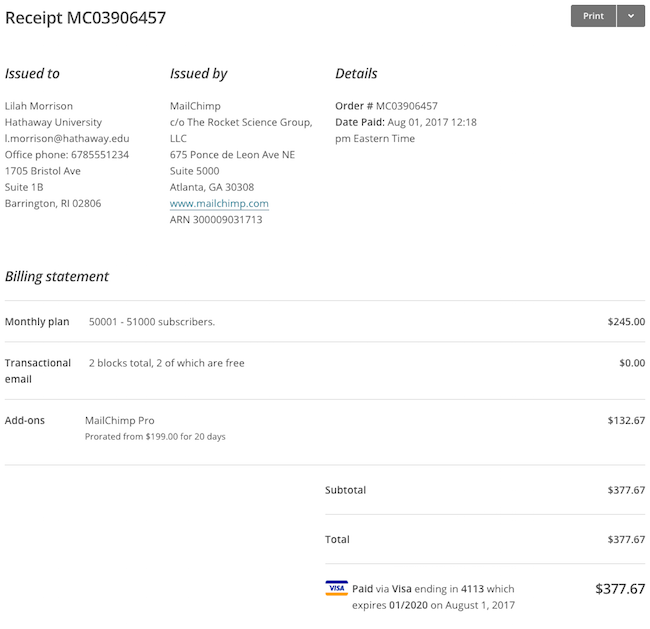 Log in with your Mailchimp credentials to view the printable receipt. Learn about common Mailchimp billing problems, such as rejected credit cards and failed PayPal payments, and how to fix them.